Epic War TD 2 is a tower defense game that looks great and gives you a strategy based experience. Like its award-winning predecessor, it’s well balanced and challenging to play through without being pull-your-hair-out difficult. If you are looking for a quick play through, this one isn’t for you; the difficulty and production value are two things that this title isn’t lacking. The game doesn’t bring anything new to the table – Epic War TD 2 is your basic tower defense title with little innovation and reasonably standard instrumental background music. Basically enemies, in this case different kinds of mecha suits, tanks, and other artillery, move down a set path. There are certain spots along the path that you are allowed to put defensive weapons like turrets and rocket launchers; the goal is to destroy all of the enemies before they make it down the path. To place the weapons it costs a certain amount of money depending on what machine you want to use; money is gained for each enemy you kill. Smaller enemies like drones and mariners are worth less than something like a tank; their worth correlates to the how difficult it is to destroy the enemy, and of course the more destructive and better a weapon is, the more it costs to put out and upgrade as well. There is also the fact that all enemies are weak to certain types of weapons. For example, the light mechas are taken out much more easily by a heavy gun, while air mariners require sentries to bring them down. 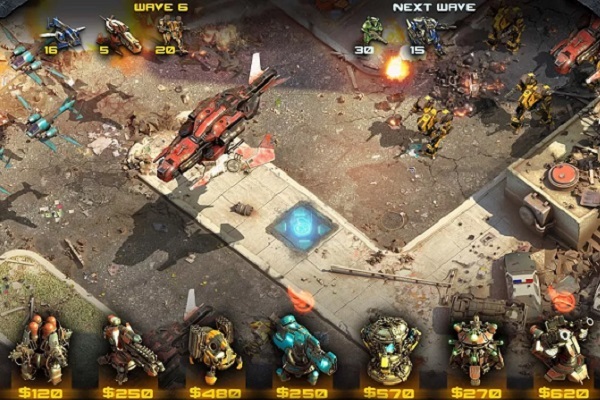 The most difficult part of the game is balancing what type of enemy each weapon can take out at what upgrade level, and since whatever setting you put together carries over into the next swarm, looking ahead at the on screen indicator to see what is coming in the next swarm is key. Several times I found that if I had drones coming through now, but there was a tank involved in the next swarm, putting out something like a rocket launcher, which bombs an entire area rather than a single target and are made to take out tanks, instead of several flamethrowers, which are tailored to take out drones but do little damage all together, actually benefitted me more. The rocket launcher could handle the mob of drones well enough to get me through, and I needed the extra firepower it provided to take out the upcoming tanks in the next swarm. Since you also can’t remove a weapon once you put it down and you have limited slots to put out artillery, sometimes you have to get creative when figuring out what weapon can handle which enemies. The other tricky thing is that there are sometimes a huge number of swarms per level, and once you complete a swarm and move onto the next, everything that happens to you stays intact. 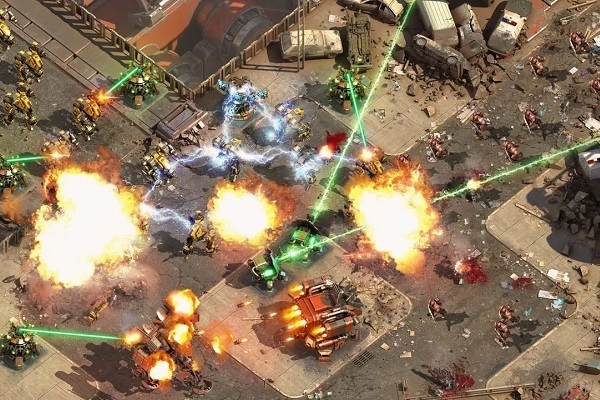 Whatever defensive weapons you have put down carry over to the next swarm, as well as how many enemies have slipped past your defense and how much money you have. You are allowed nine “mess ups” every level; that is, if nine enemies make it past your defense for the chapter, then you still clear the chapter. However, if ten get through you automatically fail and start over from the last checkpoint of the level. Similar to the ultra popular Kingdom Rush game, Epic War TD 2 takes the truest form of tower defense and gives it to you in spades. It is broken up into chapters, and the chapters are broken up into levels. There are 10 levels per chapter, and a different number of swarms per level – the higher the level, the more enemy swarms, and the harder it is. There are also three stars awarded per level; two checkpoints and a completion, and you collect stars to unlock different types of defensive weapons and upgrades for the weapons you already have. All in all, Epic War TD 2 is a solid game, and the only problem I had is that it is strictly tower defense; there is no storyline or plot at all. There wasn’t even an introduction to explain why you are destroying the enemies that are parading down the paths of each level; I wasn’t even sure if I was representing the good guys or the bad guys. However, what I am sure of is that the game is cheap to download, and free to play after that – there are no in app purchases to tempt you out of any more money; the price tag in the Play Store is the price you pay, period. Considering the difficulty level (which cannot be changed or adjusted) and the great graphics, this game is pretty inexpensive, especially if you stack it up against how long you will be able to enjoy it after you download it. The paper-rock-scissors aspect will have you puzzling out solutions, and the levels are persnickety enough that even placing the same weapon in a different slot on the field can sometimes mean the difference between victory and defeat (I would know; I replayed several levels with this in mind just to see if it made a difference. Spoiler Alert: it does). Though it doesn’t bring anything new to the table, it is certainly an engaging title, so if you are looking for hours of classic tower defense, look no further than Epic War TD 2.